A monument in memory of thousands of Soviet era soldiers - who died while liberating Vienna from Nazi occupation - has again been desecrated, prompting the Russian embassy in Austria to file a strong protest to Austrian authorities. 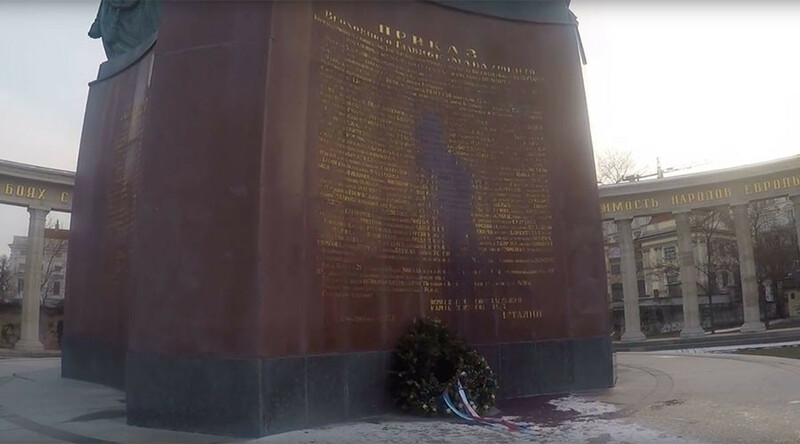 The foreside of the Heroes' Monument of the Red Army located at Vienna’s central Schwarzenbergplatz square was daubed with dark-red dye, the Russian Embassy in Vienna said in a statement, while condemning the incident. The embassy also urged the authorities to “take comprehensive measures to provide necessary security for the memorial” in the view of repeated incidents of its desecration, in the Austrian capital. On February 23, 2015, it was defaced with black dye and, on May 8, 2014, it was vandalized with blue and yellow dye, resembling the colors of the Ukrainian national flag. Following those incidents, the Russian embassy also demanded that Austrian authorities take necessary measures to protect the monument and to stop such incidents from occurring again. The Heroes' Monument of the Red Army in Vienna was erected in August 1945 to commemorate the 17,000 Soviet soldiers who were killed in the Battle for Vienna between March and April 1945 during WWII.